My birding highlight today was undoubtedly the pale and minimally marked Snowy Owl I saw at the beach. The bird was roosting on top of a “snow dune” in the western panne when I first noticed it. After a few minutes of looking at and photographing the bird I noticed someone walking almost straight towards it and me from the west, waving his arms. At first I thought he might be a birder or photographer alerting me to the owl, but it became apparent that he was just walking his dog on the beach and waving his arms for exercise. When this fellow and his dog got too close, the Snowy Owl flew about a hundred yards to the southwest and landed on the open beach outside the protected area. The bird remained here until the dog walker turned around and started heading back west. When the guy and his dog got too close again the owl flew back to the north and landed on top of the shelf ice on the beach. I watched the bird for a little while but when I looked back a few minutes later I didn’t see it. 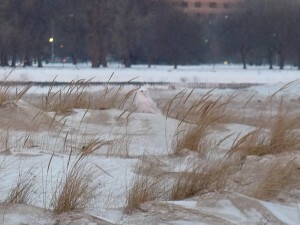 This is the palest Snowy Owl I’ve seen anywhere this season, and one of the palest I’ve ever seen. I’m guessing it’s an older male. Unfortunately the photos I took don’t do it justice. After the Snowy Owl excitement I walked back along the lake and had a group of 5 White-winged Scoters, including 3 adult males, very close to shore near the tower in the native planting area. 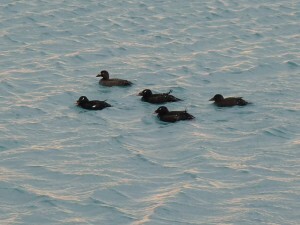 This has been an exceptional winter for White-winged Scoters along the Chicago lakefront. This entry was posted in Winter Bird Reports and tagged Owls, Snowy Owl, White-winged Scoter on January 30, 2014 by rhughes. Karen and I were feeling adventurous today so we decided to walk over to Montrose for a change. I live about a mile from Montrose and I almost never walk over there anymore. 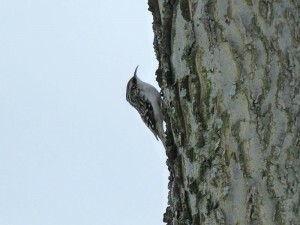 The theme for the day was ice and snow everywhere, and not many birds to be seen. Except for a few open patches of water, Lake Michigan was iced over as far as we could see. 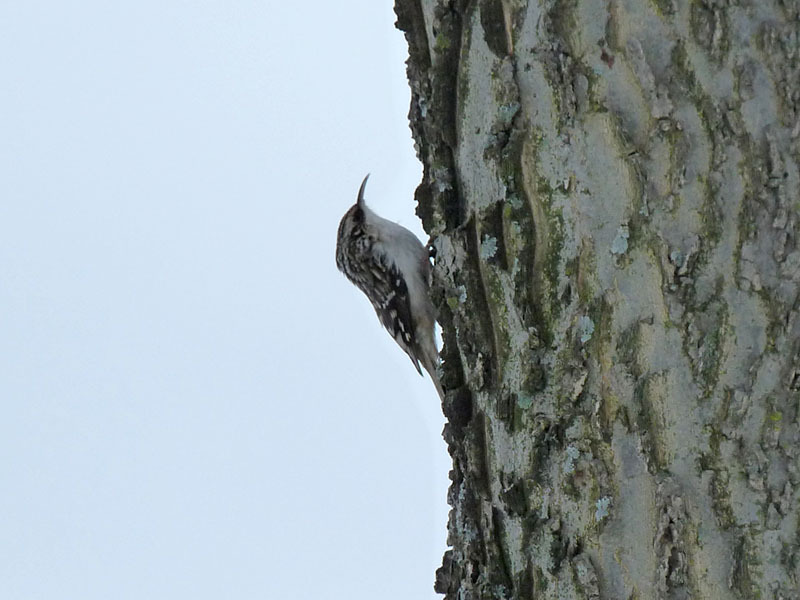 Our birding highlights were a surprise Brown Creeper working a hackberry tree in the Marovitz golf course and a dazzling adult male White-winged Scoter swimming in a very small area of open water at the harbor mouth. We also saw a few Greater Scaup, a Fox Sparrow near the Magic Hedge, and good numbers of American Robins feeding in hawthorns near the beachhouse. This entry was posted in Winter Bird Reports and tagged Waterfowl, White-winged Scoter on January 26, 2014 by rhughes. I thought the Snowy Owl parade was over at Montrose but this morning I saw a heavily marked individual on the fishing pier. The bird was initially near the beach but flew down and landed on the ice inside the fishhook part of the pier. As I was leaving I checked the pier again and the bird was back up on it near the light tower. This is the first Snowy Owl I’ve seen at Montrose in several weeks and the first of the year. 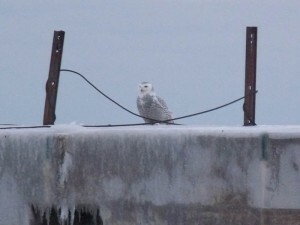 This entry was posted in Winter Bird Reports and tagged Owls, Snowy Owl on January 26, 2014 by rhughes. I walked around Montrose for a little while this morning. There wasn’t a lot around, as is expected for mid January, but I did see 2 Snow Buntings on the beach inside the protected area and a White-winged Scoter just outside the entrance to the harbor. The scoter was right up against the rocks with a group of Mallards. I saw nothing else of note birdwise, though the ice formation on the beach is rather striking. This entry was posted in Winter Bird Reports and tagged Longspurs, Snow Bunting, Waterfowl, White-winged Scoter on January 26, 2014 by rhughes. 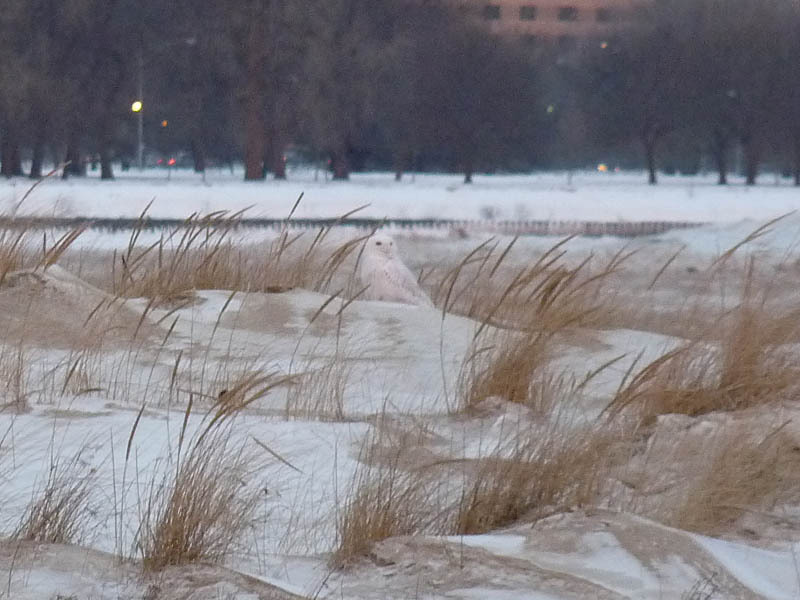 I was surprised to see 4 Snowy Owls at Montrose this morning. I thought most had left but it appears more came in to replace them. Two were on the fishing pier, one was on the ice shelf at the west end of the beach, and the other was flying south over the point, almost like it was migrating. I also saw an adult or near adult Glaucous Gull flying north, the Snow Goose in the harbor, and 4 Snow Buntings and a single Lapland Longspur on the beach. This entry was posted in Winter Bird Reports and tagged Glaucous Gull, Gulls, Lapland Longspur, Longspurs, Owls, Snow Bunting, Snow Goose, Snowy Owl, Waterfowl on January 26, 2014 by rhughes. I had 2 Snowy Owls at Montrose this morning, an immature male or older female sitting on the shelf ice at the east end of the beach and an immature male or older female on one of the star docks inside the harbor. I did not see the immature female, which had been hanging around the fishing pier. I also had a Snow Bunting and Lapland Longspur flying over the beach. This entry was posted in Winter Bird Reports and tagged Lapland Longspur, Longspurs, Owls, Snow Bunting, Snowy Owl on January 26, 2014 by rhughes.